It’s 4:30 pm on Friday and Mr. Manager comes along to tell you that he needs you to run some important ad-hoc analysis for him. Previously this meant having to stay late at the office, writing cumbersome queries to extract business information from transactional data. 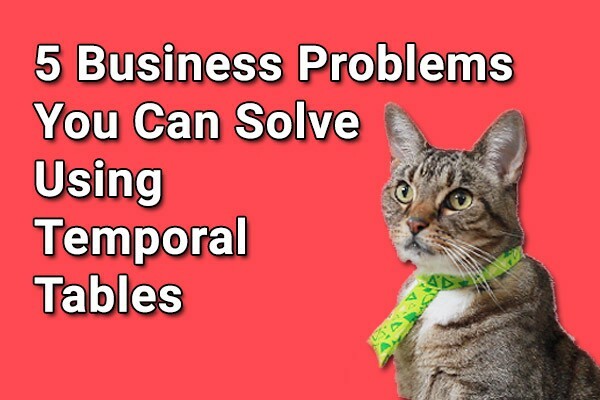 Lucky for you, you’ve recently started using Temporal Tables in SQL Server ensuring that you’ll be able to answer your boss’s questions and still make it to happy hour for $3 margaritas. Sound like a plan? Keep reading below! I know this query seems lame — it’s just a SELECT FROM statement. There are no FOR SYSTEM TIME clauses, WHERE statements, and no other interesting T-SQL features. But that’s the point! Have you ever had to get the “current” rows out of a table that is keeping track of all transactions? I’m sure it involved some GROUP BY statements, some window functions, and more than a few cups of coffee. 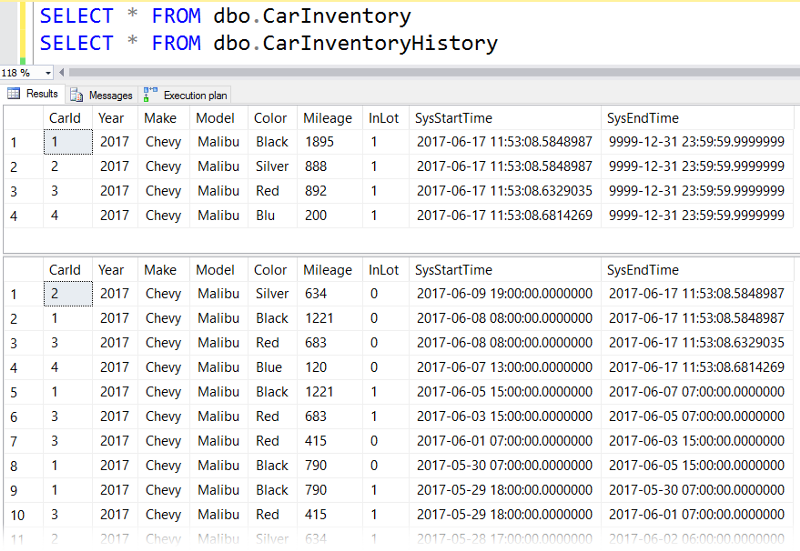 Temporal tables automatically manage your transaction history, providing the most current records in one table (dbo.CarInventory) and all of the historical transactions in another (dbo.CarInventoryHistory). No need for complicated queries. Some cars get driven a lot more. Causation or correlation? Once again, there isn’t anything too fancy going on here — but that’s the point. With temporal tables, your data is organized to make analysis easier. Here at Wagner Car Rentals we want to figure out how often our cars are being rented and see how those numbers change from week to week. In this query, we are using FOR SYSTEM_TIME FOR/TO on our temporal table to specify what data we want in our “CurrentWeek” and “PreviousWeek” subqueries. FOR/TO returns any records that were active during the specified range(BETWEEN/AND does the same thing, but its upper bound datetime2 value is inclusive instead of exclusive). We’re thinking of expanding our fleet of rental vehicles and want to purchase cars in the most popular colors so we can keep customers happy (and get more of their business!). How can we tell which color cars get rented most often? Here we use CONTAINED IN because we want to get precise counts of how many cars were rented and returned in a specific date range (if a car wasn’t returned — stolen, wrecked and totaled, etc… — we don’t want to purchase more of those colors in the future). The computer systems that we use at Wagner Car Rentals are a little…dated. Although we could have fixed this issue without using a temporal table, it shows how having all of the row-level transaction history makes it possible to repair incorrect data in more difficult scenarios. For even hairier situations, you can even roll-back your temporal table data. Temporal tables are easy to setup and make writing analytical queries a cinch. Hopefully writing queries against temporal tables will prevent you from having to stay late in the office the next time your manager asks you to run some ad-hoc analysis.